The new match grade ammo is loaded with a 452 gr MTAC Cutting Edge Bullet which has a much higher ballistic coefficient (G1 .83 / G7 .42) than our previous bullet. 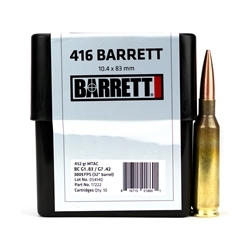 The match grade brass is made by RUAG / RWS, the prized maker of match 50 BMG brass. This match grade brass has concentric necks with uniform wall thickness which give more consistent neck tension. The new match grade ammo is loaded with Alliant Reloader 50 powder which is known for its clean burning and is less sensitive to case capacity. The match grade RWS primer burns more consistent and aids in very low velocity SDs. While combining all of these traits with Barrett standards, a shooter will have sub MOA performance capable of hitting targets well beyond 2500 yards. Muzzle velocity is 3005 fps from a 32” barrel. Some states have additional steps required to purchase ammunition online. View our shipping policy for more information.